“Inside a tent it’s cozy. But what is going on outside? Is it dark? Is it scary? Not if you have your trusty flashlight! Told solely through images and using a spare yet dramatic palette, artist Lizi Boyd has crafted a masterful exploration of night, nature, and art. Both lyrical and humorous, this visual poem—like the flashlight beam itself—reveals that there is magic in the darkness. We just have to look for it.” Publisher. You might have to be from my generation or vintage to remember the drawings we did as children, where after painstakingly drawing a rainbow pattern on a piece of cardboard the child artist then coloured over the drawing from edge to edge with the thickest black crayon possible. We then had fun exposing the drawing underneath by scratching away at the black crayon wax. I am pretty sure Crayola came out with a ready produced version – it wasn’t nearly as much fun as making it from scratch! The pages in this book remind me of that technique. The page is dark with black and grey imagery but as the flashlight is turned to an object or area and it’s illuminated, we discover so much more about the creatures of the night and the surrounding environment. We are also teased with glimpses through cut outs to the next pages. 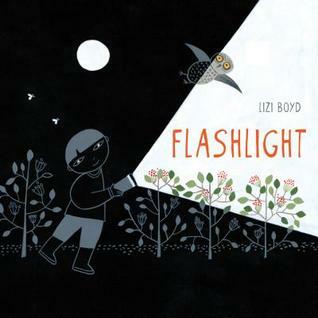 This is just the sort of book to encourage children to get out and explore – especially at night. It would be a great provocation for an activity to do as a family or even on a school camp (if the area had been scoped out first!). It could also be used to talk to a child about fear of the dark, especially if used with Lemony Snicket and Jon Klassen’s “The dark”. See this review from Margie Culver at Librarian’s Quest blog. Margie reviews a fabulous variety of picture books, narrative non-fiction and junior/MG fiction and I have grown to trust her opinions implicitly. NZ RRP $30.00. I bought our library copy at TimeOut Book Store in Mt Eden – where they helpfully provided a complimentary dust jacket.